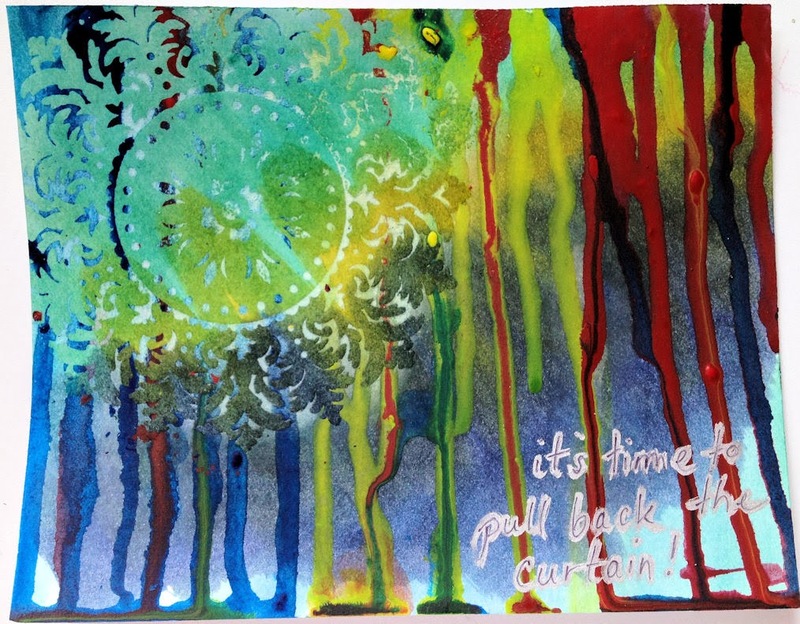 Smeared & Smudged is having a week-long "kick-start your art" challenge to create themed art-journal pages. I don't art journal. I'm not even a big fan of the mixed media trend. However, I like the idea of trying something different and forcing myself to do something a bit creative every day. So. Out of my little box I pop. I laid down swipes of 4 TH stains on white paper (I don't have a book for this but I might bind the papers together at a later date). I used clear EP to lay the SU Medallion stamp on top. I dripped red, blue and yellow heavily watered down acrylic paints down the page from the top edge. "it's time to pull back the curtain" was written with a large silver paint Sharpie and to make it a bit more legible, I wrote it again on top of the silver with a thin black Sharpie. So glad you got your kick on! This is an amazing page. Wonderful idea to emboss the Medallion. Looking to seeing more from you this week Jengd. Very beautiful! You have taken to it like a fish in water! don't agree with you : you are a mixed-media artist !!! your page is awesome, I mean it ! Stay out of the box because your journal art is fabulous. Thanks for joining us and inspiring me!